At work, we have an event every year where vendors bring in assorted chips, nuts, bars, and other snack foods. We taste all of the products, and then vote on which items we'd like to see stocked on campus. Knowing how much I love sampling things and trying new products, you can imagine how much fun this is for me! I could easily fill my blog for an entire year with just the products I have tried at these product fairs. 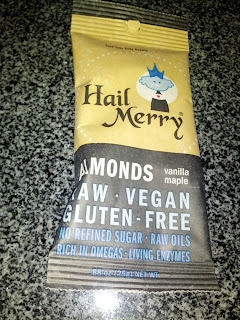 But, I'll spare you and only share the ones I found to be particularly noteworthy ... like the vanilla maple almonds from Hail Merry! I was addicted to these nuts. 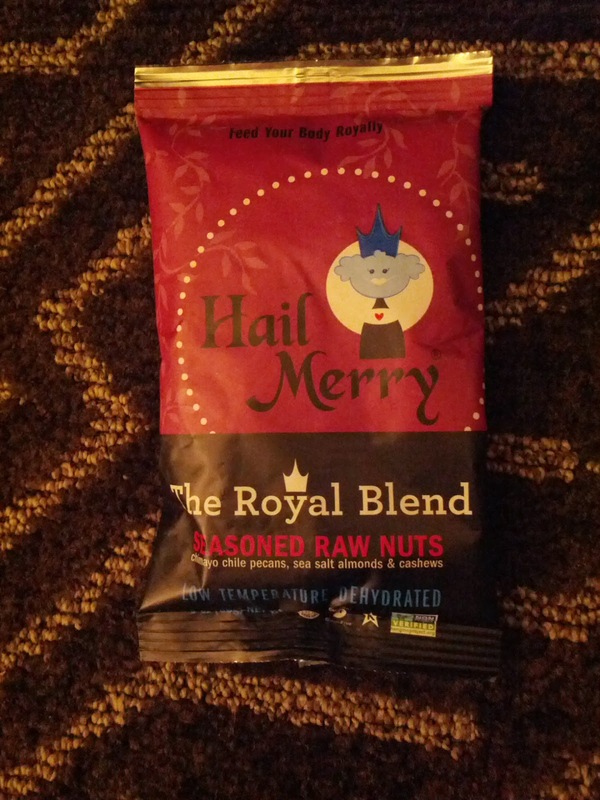 Unfortunately, they did not get selected so my supply has run out, but since then I've also had the chance to try more Hail Merry products, like aboard Virgin America. 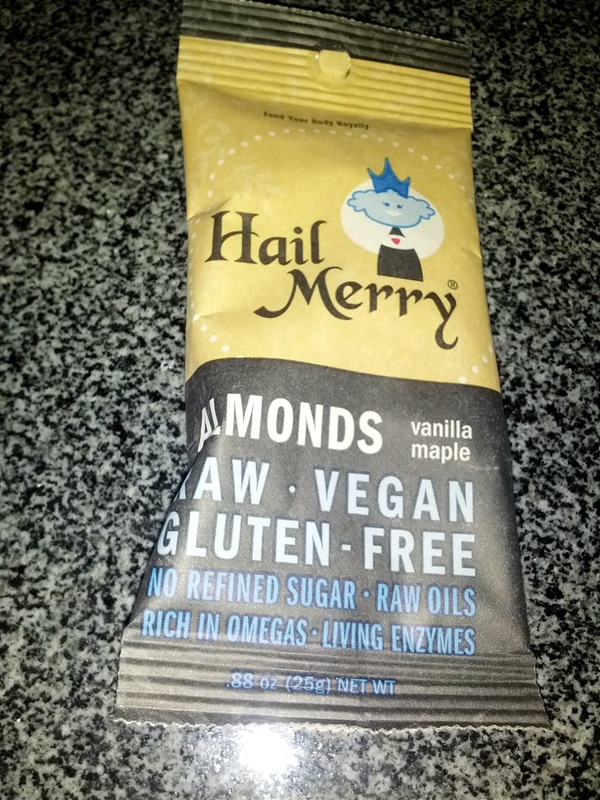 Hail Merry has several product lines: nuts and seeds, macaroons, and "miracle tarts". I've never tried the tarts, but they look like little refrigerated tarts. Hail Merry products are all raw, gluten-free, vegan, do not use refined sugar, non-GMO, etc, etc. And, it just so happens, actually taste good too! "Rather than roast our almonds, we season them with organic Madagascar Bourbon Vanilla and then dehydrate them at very low temperatures to protect the naturally occurring plant oils." I adore these. Fresh tasting almonds, coated in the most absolutely delicious vanilla maple stuff. Sweet, but not too sweet. The vanilla flavor is really strong. They go well with coffee, with tea, or just as a snack. Love them. 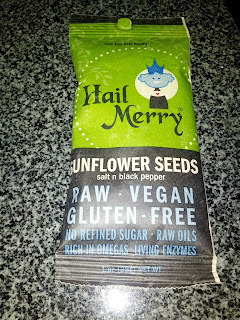 "Our sunflower seeds are dehydrated at low temperatures to protect the natural oils that absorb our classic seasoning combo of fresh salt and a kick of black pepper." These are exactly what they say they are. Just … salt and pepper sunflower seeds. Interesting kick from pepper. Not my thing though. "Instead of roasting our nuts, we season then dehydrate our nuts at very low temperatures. Orange Rosemary blend tastes of fresh pine, tangy orange and a touch of sea salt. " Nice flavors, strong, a little unexpected. They go very well with red wine and cheese. 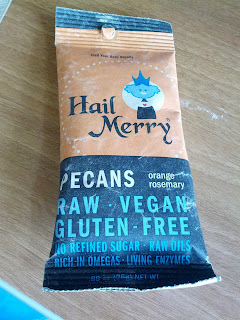 "This nourishing Royal Blend of raw cashews, Celtic sea salt almonds and Chimayo Chile pecans is a satisfying snack any time of day." Chimayo chile pecans, sea salt almonds, cashews. All very … plain. 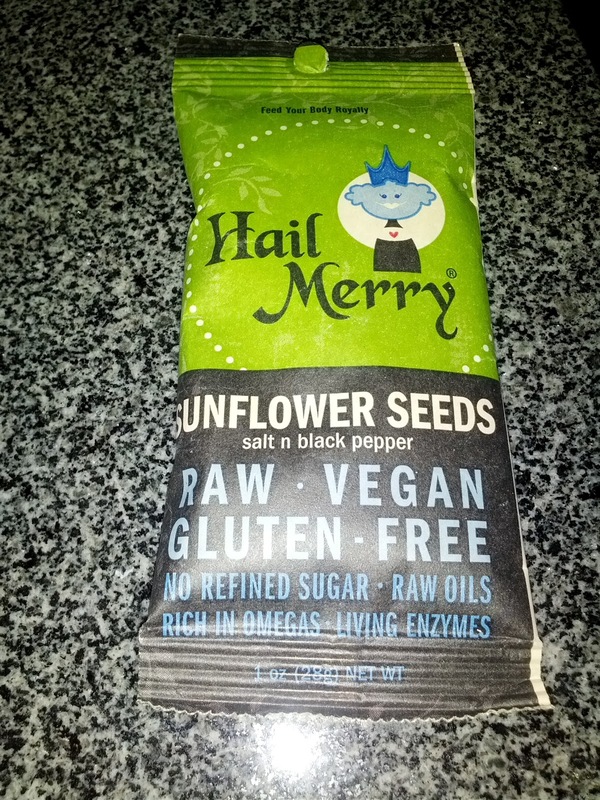 I expected a lot more flavor, particularly since Hail Merry’s other nuts and seeds had so much. The majority of the mix was cashews, next prevalent was almonds, and finally, pecans. The almonds and cashews seemed to just be salted, no additional seasoning, the cashews even more plain than the almonds. But the nuts were high quality. The pecans were the best, a tiny bit of interesting spice from the chile, but also, there was pepper. The pepper ended up overwhelming most other flavor, which was surprising, but grew on me. I was surprised by the very simple ingredient list: organic maple syrup, organic shredded coconut, Fair trade dark cocoa, organic extra virgin coconut oil, organic Madagascar bourbon vanilla, sea salt. These weren’t quite what I was expecting, as they were intensely chocolatey. 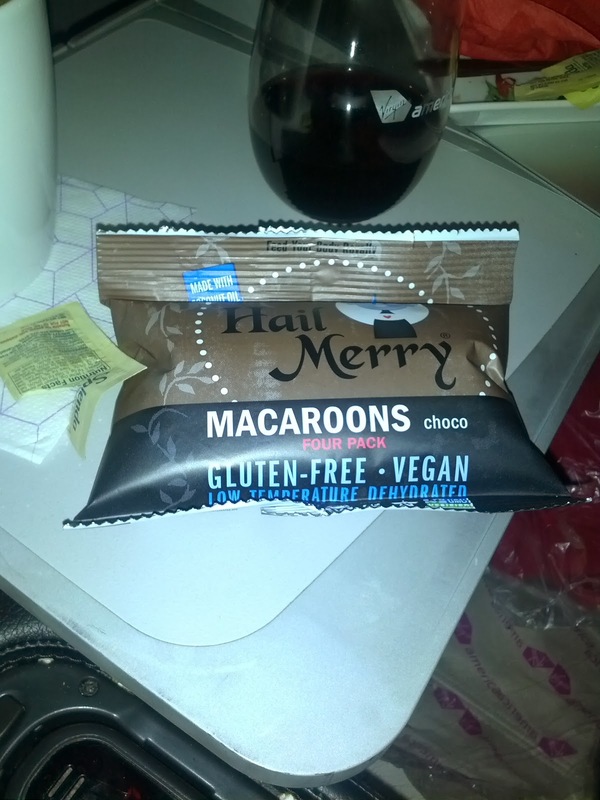 They reminded me more of a brownie, albeit one with a lot of coconut flakes, than a macaroon. The strong cocoa flavor was complex and fairly dark and bitter, and although there was sweetness from the maple syrup, these were not particularly sweet. They were decent, but I'd like to try some other flavors before I'd go for these again, like the Caramel Sea Salt or Chocolate Chip Cookie Dough macaroons. Each macaroon was a little puck, and a serving size listed on the package was two, which seemed about right for a small snack. I eat a lot of ice cream. For the most part, I don't blog about it. Most of it is just standard ice cream, from a pint in a grocery store, or, more often, soft serve from the machine at my office. I've also tried most of the quirky, unique San Francisco ice cream shops, offering up non-mainstream flavors, but it isn't a scene I've really gotten into. Ok, ok, I admit it, I do love Mr. & Mrs. Miscellaneous, but Bi-Rite? I really don't understand the hype, nor the willingness of folks to wait in ridiculously long lines on freezing cold days for it. 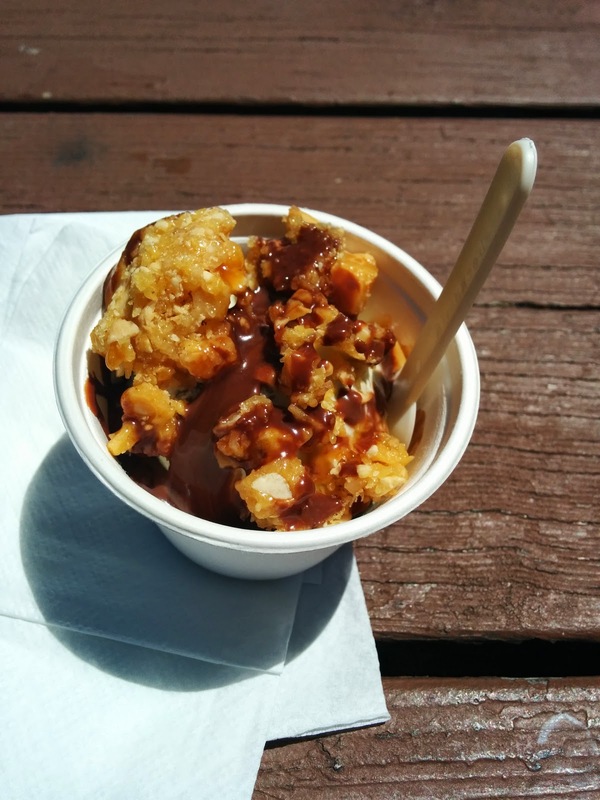 Or, Humphrey Slocombe? Sure, the flavors are novel, but ... meh. Given all this, it makes sense that it took me a few years to get to Smitten Ice Cream. 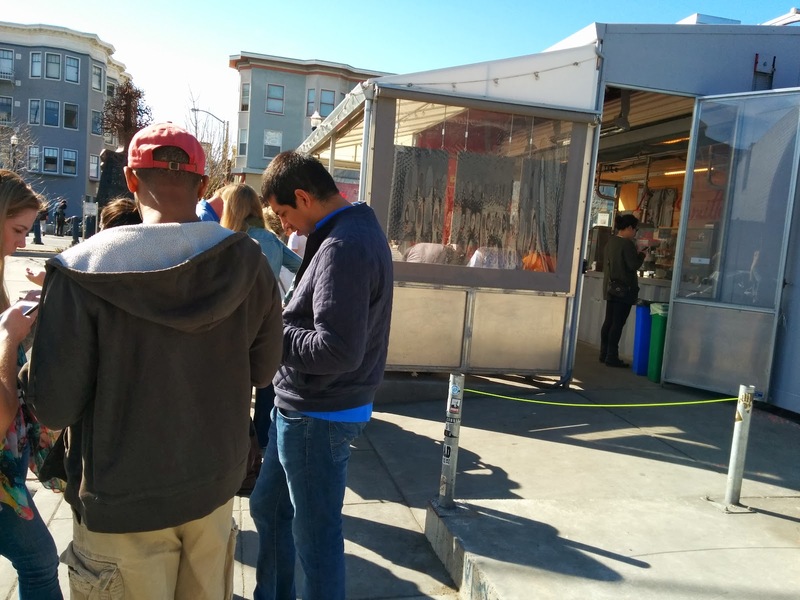 Yes, I like ice cream, but it seemed like yet another San Francisco trend, always with ridiculous lines. The San Francisco location is in a parklet in Hayes Valley, in a shop crafted out of a shipping container. They also now have a location in Oakland, and one down in Los Altos as well. 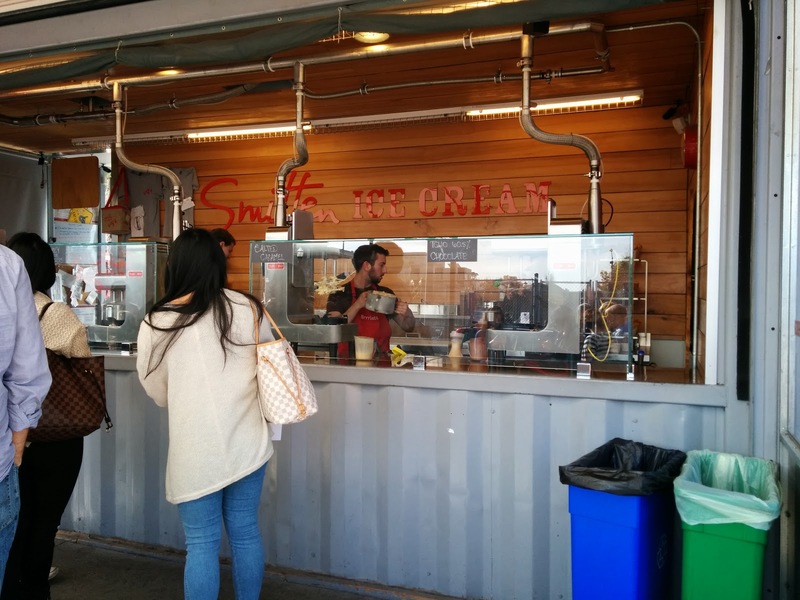 The shipping container houses the area where the ice cream is made, and an awning extends out over a few benches for seating. But most people take their ice cream to the sunny park across the street, and mingle with the folks sipping juice from the juice shop, or coffee from the coffee shop (both popup style), or pizza from a food truck. So. Trendy. I wanted to hate everything about this place. But the shipping container isn't even the trendy part. The ice cream is prepared, batch at a time, using liquid nitrogen. The claim is that since it can freeze ridiculously quickly, you wind up with a much smoother product, and you don't need to add any chemicals or stabilizers, since it doesn't need to have any shelf life. You can create a premium product, made from all "real" ingredients. They use only organic milk and cream, source the fruit from local farms, the chocolate from a local chocolate candy. And, they price it accordingly. This is just the dessert version of $4 toast. On my first visit, I was apparently not unique in my seeking out ice cream on a reasonably hot San Francisco Saturday afternoon. I wondered if the long line was really going to be worth it, as it certainly wasn't moving quickly. As in, it was barely moving. The line was just to order, once you ordered, your ice cream still had to be made, and there was a wait after that too. I'll admit, I was a bit grumpy by the time I got my ice cream. 25 minutes elapsed between the time I took this photo of the line, and the time I took the photo when I got my ice cream. I think my total wait time was closer to 30 minutes, since I didn't snap this photo immediately. San Franciscans love to wait in lines ... I hated that I was one of them. Inside, each machine makes one flavor. Each batch of ice cream is made individually in a machine dedicated to that flavor. Since they have only 4 machines, this means they exactly 4 flavors on any given day. They always have classic vanilla and chocolate (60.5% TCHO), along with a monthly flavor (on my first visit in February it was earl gray with chocolate chips), and one other (alternating between salted caramel, mint chip, and brown sugar cinnamon). Each machine is staffed by an single worker, who completes a batch, pulls the container off the machine, and then immediately starts another batch churning. Once it starts up, he or she turns their attention back to the completed batch, and begins filling orders, one by one, until it runs out. A batch seems to produce about 5 scoops. Depending on what the people in front of you have ordered, this can take a while. Besides the base flavors, you can add toppings. Sauces are available for 50 cents each (updated: now 75 cents), and include TCHO chocolate sauce and 3 types of caramel (spicy, brown sugar, or malt). In all the orders I saw, the sauces always amounted to a tiny drizzle, so I'd recommend doubling up on the sauces. I'm really not sure why they apply so little. Or, you can splurge for a crunchy topping for 75 cents, and pick from toasted walnuts, TCHO crispies, cinnamon shortbread, housemade brittles (peanut, pistachio, almond), or fresh whipped cream. Unlike the sauces, these seem to be applied in generous amounts. The menu is rounded out by vegan popsicles and a few bottled drinks, neither of which I tried. 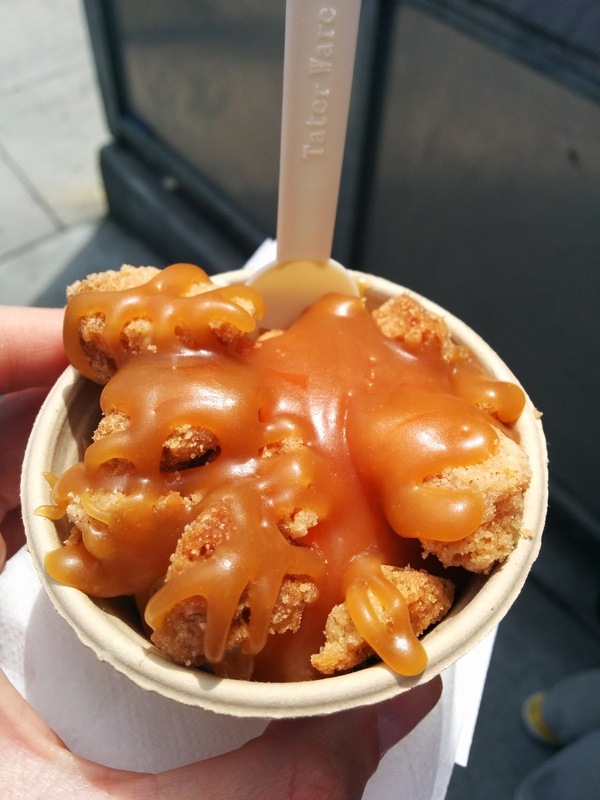 Munchkin Vanilla with Brown Sugar Cinnamon Caramel and Peanut Brittle. $4.25. As I said, I was a bit grumpy by the time I finally received my ice cream. Was it really worth a 30 minute wait? I'd actually avoided going to Smitten for several years because it sounded so hyped. But ... damn it was good. A few bites, and I immediately stopped caring about how long I'd been waiting. Yes, indeed, it was worth it. The texture of the ice cream was unlike anything I'd ever had before. It was fluffy, yet dense. Insanely creamy. Very, very rich. Wow, ok, so the nitrogen thing isn't just a gimmick, it produces amazing results. None of the flavors that day really jumped out at me - I didn't want the caffeine from chocolate or the seasonal earl gray, so I was left with vanilla or salted caramel. I would never normally order vanilla, except that I wanted to try out the toppings, as I was really in an ice cream sundae sort of mood, and I didn't think putting caramel on caramel ice cream would make sense. So, I was boring, and got vanilla. It wasn't the most intense vanilla flavor, in fact, the vanilla was barely noticeable, but the toppings made up for it. I wanted a sauce, and my choices were three types of caramel: spicy, malt, or brown sugar cinnamon. I didn't really know what was different about them, so asked for a recommendation, and the person taking my order suggested the brown sugar cinnamon. So I went for it. It was sweet, a bit cinnamony, not bad. But there was very, very little of it. Just a tiny drizzle. Toppings cost the same no matter what size you get, so if I'd had a bigger ice cream, I think I would have wound up with only 2 bites with sauce. It was not hot, and was a bit thick, but just a tiny tiny drizzle. I'd gladly pay double for more, as this wasn't sufficient. 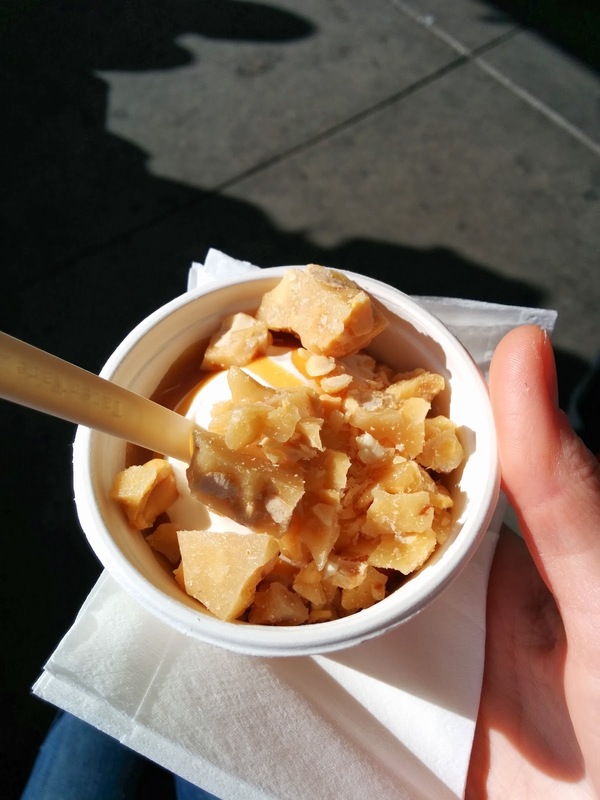 I also wanted a crunchy topping, so went for the housemade peanut brittle. I was hoping it would add a crunch, obviously, but also a sweet and salty component. Unfortunately, it didn't really have any salt to it, not in the peanuts, not in the brittle. But, it was crunchy, it was sweet, and I enjoyed it. Definitely a premium topping, and that was applied in generous amounts. The ice cream didn't melt too quickly, and I loved the even smoother consistency it got as it melted slightly. I tried to stop devouring it to let it melt a little, but ... it was too hard to resist. Seriously, so good. Smitten isn't a cheap place, as a small, without toppings, is $4.75. I knew a secret though - it isn't listed anywhere on the menu, but you can get a "munchkin", a single scoop, for $3. I saw several smalls come out ahead of mine, and I really didn't think my munchkin was that much smaller. It wasn't a huge ice cream, but it was plenty satisfying as an after-meal treat. I think my munchkin plus two toppings was a better deal than a plain small. Munchkin Rhubarb Crisp with Toasted Walnuts and Whipped Cream. $5. So, I went back. This time my choices were again vanilla, chocolate, and salted caramel, along with the seasonal flavor for April: Rhubarb Crisp. Due to its more complicated mix-ins, the rhubarb crisp carried a $0.50 premium. I'm not sure if I've ever written about my distaste for rhubarb before, but, let's just say I sorta have a vendetta against rhubarb, due to its sneaking into my mom's homemade strawberry jam when I was a child. Even as an adult, I haven't gotten over it. But ... fruit crisp and ice cream is one of my most favorite things on earth. I liked the vanilla on my first visit, but I wasn't super excited about getting it again, and I still didn't want the chocolate or salted caramel for the same reasons as my previous visit. So ... I went for the rhubarb, against my better judgement. Like the vanilla, the ice cream was incredibly smooth and creamy. It didn't melt too quickly. 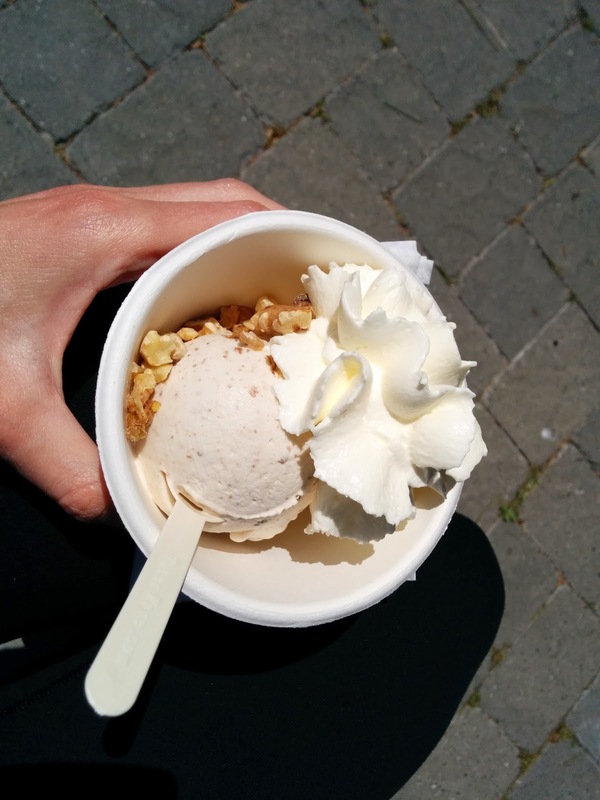 The rhubarb was added as mostly a liquid, so it was entirely integrated into the ice cream, no chunks. It was tart. Rhubarb-y. Certainly not my favorite flavor, but I did appreciate that the ice cream wasn't super sweet. The crisp part of the "rhubarb crisp" was streusel pieces, all very tiny, well mixed in. They added texture, but I would have liked bigger chunks so I could actually taste them. The base ice cream wasn't turning out to be the fruit crisp I was striving for, but I hoped my topping choices would enhance it. I always love cold ice cream with my hot fruit crisps/crumbles/pies, but, in reality, I also always want whipped cream. So, I added it to my creation. The whipped cream was very fluffy, lightly sweetened, fresh whipped cream out of a dispenser with Co2 cartridge, not canned stuff. I got a generous amount for the additional $0.75 charge. I also wanted to make sure it was crunchy and reminded me of a crisp, so I added the toasted walnuts. They were ... just walnuts. Not quite sure what I was expecting, but there wasn't anything remarkable about these. I got a generous spoonful of nuts for my $0.75. Munchkin Fresh Mint Chip with TCHO Chocolate Sauce, Malt Syrup, and Peanut Brittle. $4.75. Finally, I visited when the famous mint chip was being made! It is part of the standard rotation, yet somehow I kept missing it. I’d read great things about it, and had been hoping to run into it for ages. Like all of the ice cream from Smitten, I liked the texture, so smooth and creamy, although, it seemed less rich than some of the other flavors. Maybe I’m just used to it by now, or maybe it is due to the mix-ins? Anyway, the remarkable thing about this flavor was how intense the mint was, and, that it was real mint. Not mint flavor, but mint. It tasted like eating leaves of mint. I can honestly say I’ve never had any mint product taste so legitimately minty. I actually didn’t love that flavor, but, I was impressed. The chocolate wasn’t actually chips, rather, large flecks of dark chocolate. A generous amount of chocolate, all high quality. Given that they use TCHO for their sauces and toppings, I imagine it is TCHO as well. Speaking of the sauces, I went for a duo this time, since I have felt in the past that they didn’t put enough on. Rather than doubling up on one, I decided to ask for two, the chocolate sauce and the malt sauce. I really had no idea what to expect from a malt sauce, but I didn’t want to have caramel with mint chip, as that just sounded odd, so malt was my only other choice. The chocolate sauce was a thin style, and good enough, but it was very lost when mixed together with the malt, which, really just tasted sweet. It wasn’t the right topping for the mint chip. I also added peanut brittle, just because I wanted something crunchy, and they were out of the TCHO crispies I would have liked to add. Peanut brittle was also not the right thing to add, it was just sweet, and super strange with the mint. Good on its own, but not in this combo. So, overall, I didn’t create a winner here. I still enjoyed the toppings, and I enjoyed the ice cream, but they didn’t combine very well. And, although I really was impressed by the minty flavor of the Mint Chip, I wouldn’t go for it again. Update: Ojan got this flavor on a subsequent visit, with whipped cream and chocolate sauce. I again felt like it was crazy minty, like real mint leaves, and again just didn't care for it much. Munchkin Nectarine with Brown Sugar Caramel and Cinnamon Shortbread. $5. Seasonal Flavor for July, nectarine: "Ripened by the hot sun overhead, stone fruits from local orchards are juiciest and most plentiful throughout July." The nectarine was recommended with brown sugar caramel, so I choose that as one topping. Inspired by the thought of a fruit crisp, I also added cinnamon shortbreads, since I thought the cookie crumbles would be a bit like a crisp topping. The nectarine ice cream was tasty, same good texture and density as all of their other ice cream. It had some very small pieces of nectarine inside. Very seasonal and fresh tasting. The cinnamon shortbreads were also a fail. I didn't taste cinnamon at all, and they were just dried out and boring. Not very buttery. I appreciated the generous amount and the crumble sizes, but, I really didn't like them. A munchkin base price is $3, but nectarine was an additional $0.50, and both toppings were $0.75 each, making this a $5 investment. Normal for Smitten, but pretty pricy for such a small treat.